← How to Tell if Your New Followers Are Real or Not. Sadly, my neighbor greases her pigs so I wore myself out trying to catch one I could behead. I went home and got drunk instead. The running and beer did make me barf and the results don’t look too far off from your post. I aim to improve the quality of writing on wordpress. I can’t seem to barf – no amount of running or drinking or anything works! Can you please write a blog on How to Barf? That will appear sometime in the future. this is awesome. thank you. logging into my blog to brine my pig head now. I cannot wait to see the end results. I don’t have a pig head. Do you think I could substitute a cabbage? Does it have a face? If yes, then go ahead. I still remember that photo from last year. It is burned in my brain like the brain that was burned off the pig and used to spread on Wonder Bread. Mmmmmm….pig head on wonder bread. Your words are sheet poetry. 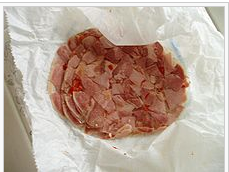 As a matter of fact, “Brine the pig head overnight.” was the name of the play Shakespeare was working on when he died. True story. “sheer” “sheer” ! I could see that was wrong as my finger hit “post comment” but there was a nanosecond delay before my brain got the message. Damn! I think my words could be sheet poetry too like my post could be printed on bed sheets and people could be like “yes!” or not. If only I had read this blog before staying up and watching “Reviving Ophelia” on Lifetime. I’d have had better luck watching the pig head. I actually love you a little bit, you know. Just sayin’. Aw! It’s my head cheese-making ability, yes?